The trailhead is at the end of a very short spur on the right with a sign post at the head of it. The beginning of the trail has been reconstructed through a clearcut and can become brushy. Shortly you will be out of the brush and in virgin habitat to the summit. Skookum Lake can be visited by way of the Skookum Lake Trail 542 which joins near the summit. The mileage on the FS Info sheet is incorrect. The trail is approximately 1.55 miles each way (round trip is 3.1 miles). Trail location is shown acurately on older topos but not the new one. For accurate trail location, refer to the Topo Map link above which has the track overlaid on a recent topo map. The former lookout site at the summit remains fairly open and offers panoramic views. There is a “kinda” spring on the way up but don’t count on it. The grade is steady but moderate. 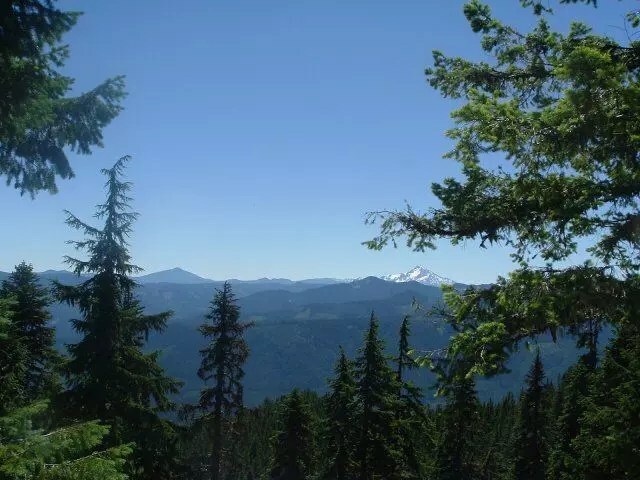 If you decide to descend towards Skookum Lake, a side trail leads towards the Baty Butte Trail 545 at the meadow area at the bottom of the descent below the rock field — left to Baty Butte, right to Skookum Lake. There is no apparent tread to the left across the small meadow but there is a blaze leading the way to the more obvious trail. This trail junction has a waypoint in the GPS track referenced on the Skookum Lake trail page. Hiked this trail today – trail is very brushy in spots but only a couple of downed logs on it. Road to the trailhead is in very good shape due to thinning projects in the area.